Tire chains are an essential part of any vehicle’s emergency kit. Particularly in the winter months, having a set of tire chains in the trunk can save you a lot of hassle and white-knuckle driving when inclement weather sets in. Tire chains come in a wide variety of styles, sizes and materials, so it can be difficult to determine which ones will work best for your car or truck and specific driving needs. We looked at tire chains for everyday use and specialized tire chains for tractors and ATVs to determine which ones provide the best performance, fit the widest range of vehicles and are easiest to attach to your tires so you can quickly get back on the road. Read more about our methodology. These spring-style tire chains offer excellent performance and grip. 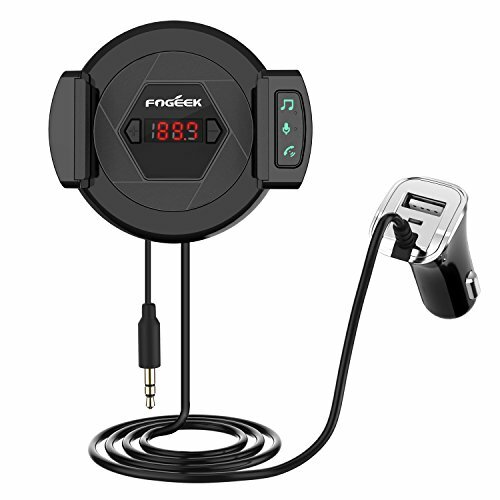 They’re also very easy to attach to tires, and they work with a wide variety of SUVs and trucks. These affordable tire chains are a great addition to your car emergency kit, offering quick and simple attachment and a lightweight design that provides excellent traction in snowy conditions. If you’re looking for a set of easy-to-use tire chains to keep in your car’s emergency kit, these rubber chains attach quickly and incorporate heavy-duty treads to handle snow and ice. These heavy-duty tire chains are perfect for pickup trucks and vans, offering exceptional traction in both packed snow and ice thanks to their unique link design. These off-road tire chains are designed for all-season use in almost any surface conditions. They feature a rugged chain design that provides great traction while driving on ice, snow and mud. Whether you’re plowing snow or just mowing a hill full of wet grass, these dependable tire chains use larger-sized links that make it much easier to get around in both snow and soft earth. The primary factor to consider when buying tire chains is how much traction they provide. Whether you’re purchasing metal, rubber or spring-style tire chains, you’ll want a set that provides complete coverage and enough traction to get your vehicle through both packed snow and ice. If you’re planning any off-road driving, you should also consider performance and handling in muddy conditions, in which case a larger chain link is your best bet. It’s also important to determine the range of compatible tire sizes when purchasing chains. A pair of tire chains should fit your tires snugly, without causing any damage or digging too far into the rubber. When buying online, you can usually input your vehicle year, make, and model to determine whether a particular set of tire chains will fit your tires. Tire chains tend to be made of either metal or rubber (or some combination of the two), and each have their strengths and shortcomings. Metal tire chains are generally more rugged and heavy-duty, but they also weigh a lot more than rubber chains and can require special tools for installation and adjustment. While rubber chains may not work for larger vehicles, they are easy to stow in a trunk or emergency kit and can get you moving quickly. Finally, it’s important to consider how easy tire chains are to attach and detach from your vehicle. If adverse conditions set in very suddenly while you’re traveling, the last thing you want is to spend an hour on the side of the road trying to attach your tire chains. In general, you should find tire chains that can be installed without tools (or with a simple vehicle toolkit), since there’s no guarantee you’ll have specialized equipment on hand during a roadside emergency. Tire chains can vary in price based on their size and material, but they’re usually affordable enough that they’re a great investment relative to their price. In general, you should expect a decent pair of rubber or metal tire chains to cost at least $50, which can vary depending on the type of vehicle you’re planning to use them with. You can find quality tire chains for less than $40, however, so if you’re only planning to need them on rare occasions, you can find simple versions on a relatively low budget. Truck and SUV tire chains are slightly more expensive, with a price point between $80 and $100. Even at the lower range of this, you can expect a high level of performance and options for quick attachment so you won’t find yourself stuck or stranded for too long. If you maintain your tire chains, you can get multiple seasons of use out of them, which can save a lot of money over time. Security Chain Company’s ZT729 tire chains provide excellent performance and traction, even at speeds of up to 30 miles per hour. They’re also incredibly easy to install, with a self-adjusting spring-style design that keeps them tightly attached as you get moving. They’re designed for SUVs and trucks, however, so they won’t work for drivers with compact cars or sedans. Simple installation. One of the biggest benefits of the ZT729 tire chains is their ease of installation. 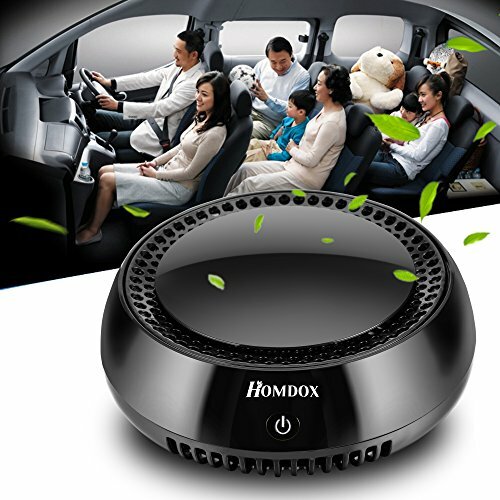 Users say they can attach them in a matter of minutes and get back on the road. Great traction, even at higher speeds. The ZT729 chains provide excellent traction without slowing travel too much. Users report that they have no problems driving around 30 miles per hour in adverse conditions with these chains in place. Self-adjusting design is very convenient. Many reviewers also praise the “self-adjusting” design of these tire chains, which tighten as you drive to ensure consistent fit and performance. Designed to fit a wide variety of trucks and SUVs. These chains are specifically designed for trucks and SUVs, so they fit a very wide variety of popular vehicles. Not sized for smaller vehicles. Because they’re specifically made for SUVs and trucks, the ZT729 tire chains won’t work for compact vehicles or sedans. The same company does make a passenger vehicle-sized version, however. Storage box tends to leak. Several users say the included storage box as a source of frustration, saying that it tends to leak or pool with water if wet chains are placed inside. Several sharp edges can cut hands. A few reviewers also mention that there are a few sharp edges on these chains, which can cause cuts during installation if you’re not careful. 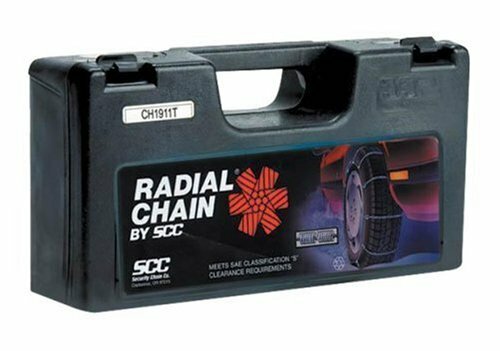 Security Chain Company’s SC1030 tire chains offer an affordable option if you’re looking for a set of light-duty chains to keep in your trunk in case of winter weather. They’re constructed of high-quality stainless steel cables, which doesn’t offer the same level of grip as a V-Bar or heavy duty chains, but they’re very effective when it comes to getting your car out of deep or packed snow and safely getting to your destination. Lightweight design makes attachment easy. Users report that attaching and using these chains is very quick and easy, especially thanks to their lightweight construction. They only take a few minutes to attach to each tire and get you on your way. Stainless steel construction is durable and dependable. Reviewers also like the construction of these chains, particularly for short-distance drives. They’re made of 3/16th-inch stainless steel cable, which can hold up to relatively frequent use. Low-profile design doesn’t build up ice or snow. Several users also mention the low-profile design of these chains as a benefit. They won’t build up ice or snow or risk damaging your car’s wheel well like heavier chains can. Prone to losing tension. Several users report that these chains can quickly lose tension, especially just after attachment. You may need to stop and re-adjust them after driving a short distance. Driving on chains can feel bumpy. 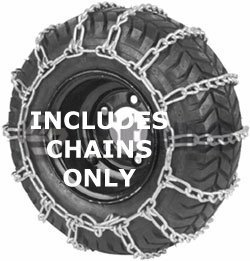 A few reviewers note that these chains can make for a bumpy ride, particularly at slow speeds and on roads that have been cleared of snow and ice. While metal tire chains tend to be a bit more rugged, rubber tire chains are a great idea for buyers who want an easy-to-attach option that can be stowed in a car’s trunk for emergencies. 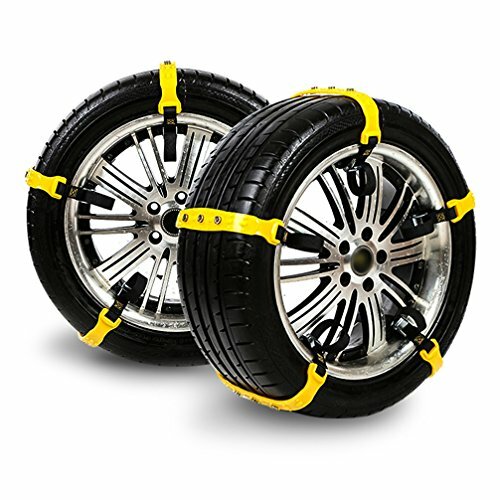 These tire chains use a sturdy rubber cleat system that can be quickly set up, allowing you to deal with the sudden onset of inclement weather and get to your destination safely. They can also be quickly removed and stored between uses. Baabyoo’s Car Security Chains are a great lightweight option for drivers who want to always make sure they have tire chains on hand. They attach quickly and easy to tires by strapping around the wheel hub, and feature embedded metal bolts that provide excellent traction. 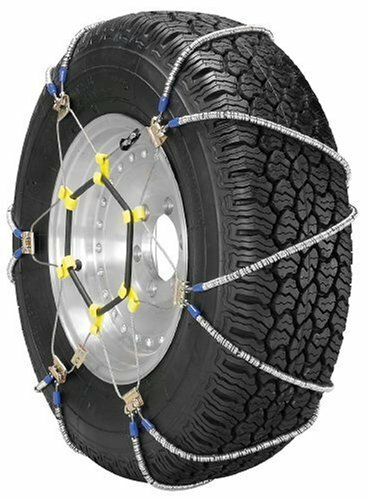 While they may not hold up to daily use (if you live in an area where you need chains all winter), they’re an excellent choice for emergency use and fit most passenger cars. Very easy to attach. Users love how easy these chains are to attach to vehicles. Each individual “chain” uses a strap that keeps it affixed to the tire using the wheel hub, so installation is quick and requires no tools. Metal cleats provide excellent traction. While these chains are mostly made of rubber, they incorporate metal cleats for added grip, and this makes a huge difference in performance. Users report that they can drive long distances in ice thanks to this design. Compact design is easy to store. Users also like that these chains are lightweight and easy to pack. They include a nylon storage bag, which holds the entire set and makes it convenient to stow them in the trunk all winter. Not ideal for everyday use. While it’s possible to drive on these chains for a long distance, users find that daily use can quickly wear them out. These are definitely more intended for emergency use. If you drive a light-duty truck, a reliable set of tire chains are a winter necessity. While many trucks offer all-wheel drive to get through piled and packed snow, they tend to have difficulty with icy conditions, so a quality set of tire chains can keep you safe and moving if roads are dangerous. Tire chains designed for trucks tend to be heavier than “spring” style chains, but this provides greater traction for larger vehicles. Security Chain Company’s QG2821 tire chains are well-suited to pickup trucks and delivery vans, providing excellent performance thanks to their unique link design. Each link has several points of contact with the road, which gives a great deal of grip in icy and snowy conditions. While this also means that individual links can be somewhat prone to breaking, the chains as a whole are well-constructed and very durable. Simple to attach to tires. Users like how easy these chains are to attach to tires. They don’t require any special tools and can be attached in about five minutes per tire. Excellent traction. The QG2821 chains use a unique link design that provides several points of contact with icy and snowy roads. This provides excellent traction, even in the worse road conditions. Quality materials should last several seasons. Reviewers also praise the craftsmanship of these tire chains, reporting that with proper maintenance and care they should easily last through years of winter use. Somewhat prone to individual links breaking. Several reviews mention individual links breaking and needing to be repaired. While broken links won’t render the chain useless, this is still a potential source of frustration. Links require significant clearance. Users also mention that these chains require a significant amount of clearance within the wheel well due to their link design. This can lead to damage if you don’t ensure that the chains have enough space to move. ATV owners who want to drive off-road in the middle of winter will need specialized tire chains, both because of the unique size of ATV tires and because they’re dealing with a wider range of weather conditions. In addition to being able to deal with ice and packed snow, ATV tire chains are also equipped to tackle mud and withstand the impact of harsh off-road conditions. 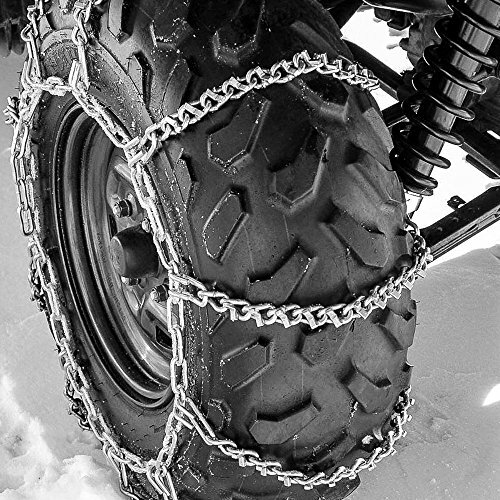 These Titan Attachments ATV tire chains use a V-Bar design that provides exceptional traction, even while driving through ice and mud. While they’re most useful when dealing with winter conditions, they perform well enough on mud to consider keeping them on hand throughout the year. While they have a somewhat limited range of compatible tires, they’re a great buy for ATV owners. V-Bar design provides amazing grip. The biggest selling point of these chains is their V-Bar design. Each chain has many points of contact with the ground or road, providing a high level of traction and control while driving in snow and ice. High-quality materials can withstand impact. These chains are also specifically designed for off-road use, which means they can deal with a lot of wear and tear. Reviewers praise their durability and performance, even on rough terrain. Great, tight fit on tires. Users also appreciate that these chains grip onto tires very well, even when driving off-road. If they’re properly installed, they won’t slip or make too much noise. Can be difficult to get the right size. These chains are available in a wide variety of sizes, so it’s important to ensure that they’re the right size for your ATV’s tires. Cleat design requires significant clearance. Because of the V-Bar design, these chains do need a lot of clearance to prevent damage to ATV undersides or low-hanging components. If you drive a tractor in the winter, especially for plowing snow, then a pair of tire chains can be an invaluable addition. Much like ATV tire chains, tractor tires need a specialized size and design of chain for ideal performance in icy conditions. In general, these tire chains incorporate a larger link size that’s well-suited for providing traction at lower speeds. Tractor tire chains can even be useful outside of winter months since they can help deal with muddy conditions and hilly areas. These Peerless tractor tire chains offer a straightforward, effective design that excels at keeping tractors moving throughout the year. The larger-sized links are specifically designed for lower-speed operation and can help out when you’re plowing several inches of snow or driving through a freshly-thawed area where you might sink in and get stuck. Larger links provide excellent grip. 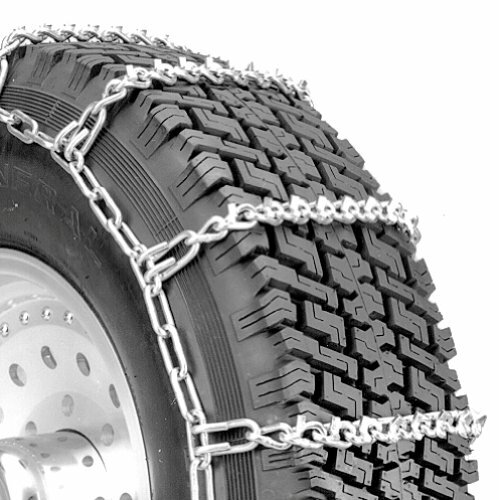 Users appreciate the larger size of these chains, especially when it comes to dealing with thick mud or heavy snow. Several reviewers report that these chains helped them get up and down muddy hills with no issues. High-quality materials. Several users mention the quality of craftsmanship on these chains. They’ll well-made and designed, and should last for years if they’re taken care of. Works across tractor brands. Reviewers also appreciate that these chains work across tractor brands and makes. This provides them with a great deal of versatility since they’re not limited to use with only one brand. Some users find installation difficult. Reviewers note that these chains can be somewhat difficult to install. You’ll need a jack to lift the tractor, and you may also need to let some air out of your tires or remove links from the chains to get a proper fit. If you’re looking for quick, straightforward installation, these chains may be frustrating.